Use A Diver's Pad in the Shower to Make Notes! Home / Gadgets / Use A Diver’s Pad in the Shower to Make Notes! 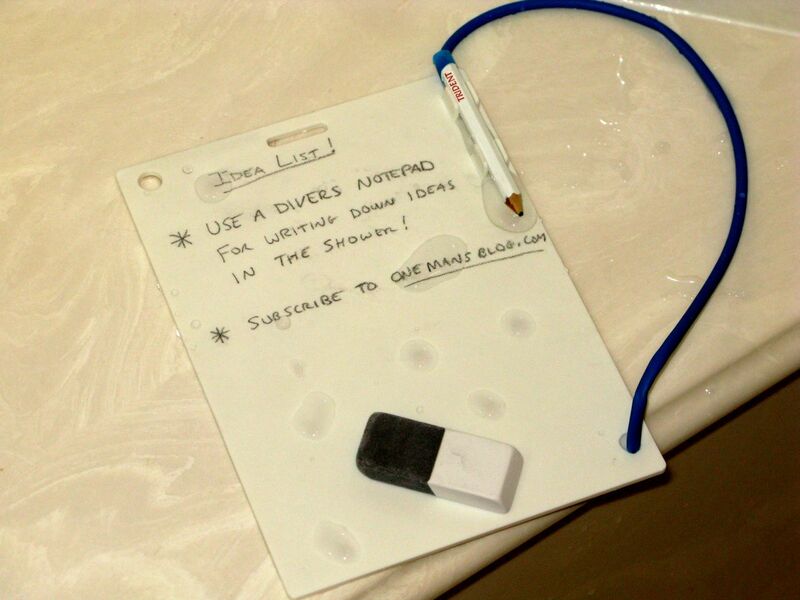 Use A Diver’s Pad in the Shower to Make Notes! January 2, 2009 By John P.
I don’t know about the rest of you, but when I’m in the shower it seems like I’m always coming up with good ideas – or at least thinking of things that I need to do. The problem is, I’ll think of five things… but by the time I’m done I can only remember two! and gave it a try. Guess what… it’s perfect! You can just use a normal pencil and eraser on the pad, which works out very nicely. I would also advise purchasing a small suction cup with a hook on it so that you can attach it to your shower wall and leave it hanging there. Your idea is a good one. I have a divers slate too, but the pencil lead begins to smear the surface after a short period of time and then I have to rewrite the notes from the slate in order to take them into the office. I recently discovered a waterproof notepad (and pencil) called AquaNotes that suction cups to the shower wall. It is fantastic because I can write down my notes and then simply remove the sheet of paper and take it with me. i love this thing because i can write stuff in the shower. this is definitely a place for ideas. I wish I was creative / intelligent enough to have these epiphanies in the shower…I generally just think about upcoming presentations, girls, or sing…nothing noteworthy. Hahahahahah! Talk about creative inspiration! Just make sure you don’t get soap in your eyes whilst trying to juggle with shampoo bottles and pencils! Great idea! There is nothing like a nice hot shower to give you a good idea. I’m not so sure I’d go as far as the Diver’s pad but it is a pretty good idea. I can smell a business somewhere there in your shower pad idea for a savvy entrepreneur. These kind of relaxation bring good ideas. And good ideas always come fast and go fast. Write down right away maybe a good idea too. You crack me up! I’d never even heard of these things, but it’s exactly what I need … my brain goes into hyperdrive in the shower, then slams on the brakes as soon as I grab my towel.